1. Adjust rocker arm nuts to eliminate lash. This must be done when lifter is on base of circle of cam. 2. Remove distributor cap and crank engine until distributor rotor points to No. 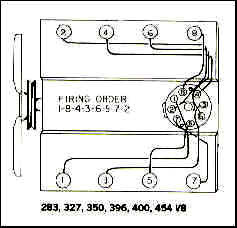 1 cylinder terminal, with points open. 3. 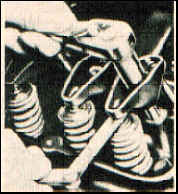 Turn adjusting nut until all lash is removed from this particular valve train. This can be determined by rotating the pushrod back-and-forth with your finger tips, while tightening the adjustment nut, until you can no longer rotate the pushrod. When all play has been removed, turn adjusting nut one more turn. This will place the lifter plunger in the center of its travel. 4. Follow steps 2 and 3 to adjust remaining valves. Rotate pushrod while tightening adjuster nut. Readjust the lifters as follows with the engine hot and running. 4. Turn nut down until clatter stops. This is the zero lash position. from the zero lash position. 7. 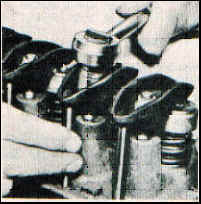 Remove oil deflector clips and replace rocker arm covers. Intake Valve Clearance: .024 in. Exhaust Valve Clearance: .028 in. 1. Set engine in No. 1 firing position. Intake No. 2, 7, Exhaust No. 4, 8. Intake No. 1, 8, Exhaust No. 3, 6. 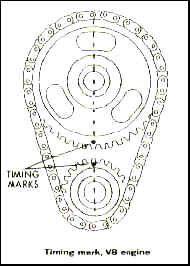 4.Turn crankshaft one-half revolution clockwise to No. 6 firing position. 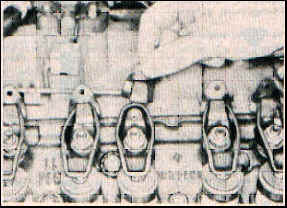 Adjust the following valves in No. 6 firing position: Intake No. 3, 4, Exhaust No. 5, 7. 5. Turn crankshaft one-half revolution clockwise. Adjust the following valves: Intake No. 5, 6, Exhaust No. 1, 2. 6. Run engine until normal operating temperature is reached. Reset all clearances.